Finally, a new quiet book page! 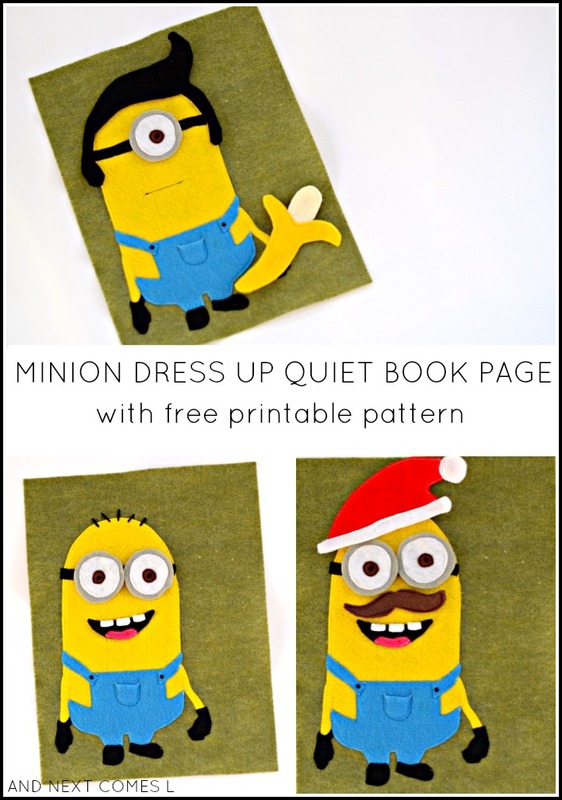 This dress up Minion quiet book page has been sitting on my craft desk for months. Only recently have I been able to find the time to actually sew it. And I must say, it's my favorite quiet book page to date. 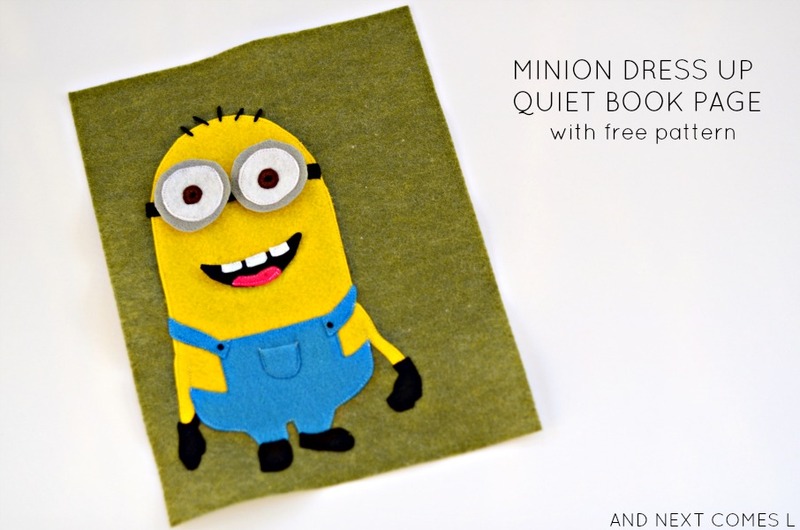 This Minion quiet book pattern comes with what you see below. The eyes and the mouth can be removed, so if the kids feel like making a two-eyed or an one-eyed minion, then they can. I machine sewed everything for this quiet book page, except for a few hand sewn details. However, it could easily be made using a hot glue gun. Actually, to tell you the truth, a hot glue gun would have been a better option than sewing for assembling the eyes and the mouth. I hate machine sewing little details. It's so tricky! 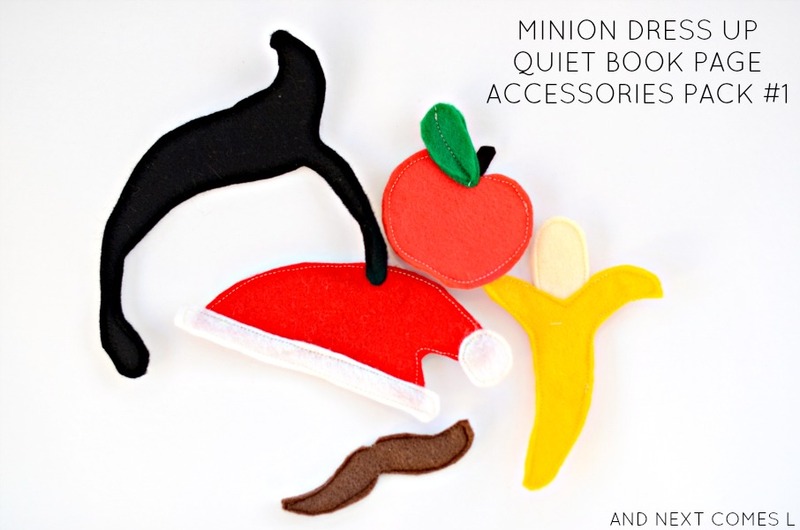 As a fun add on, I have created one accessories pack for this quiet book page. It includes a banana, an apple, a Santa hat to celebrate Christmas, an Elvis wig, and a mustache to help celebrate Movember. Or a completely silly Santa Minion who sports a wicked mustache for Movember. There is a free printable pattern for both the main quiet book page and the accessories pack. Be sure to download both printables. So cute, Dyan! What an awesome pattern! The link to the Minion doesn't work. Accessories is fine though. Please fix. Thanks! It started working again a few hours ago. Just happy you were able to get a copy of it! Hello from Hungary, we loved the Minions. My daughter loves it thanx for sharing! Do you always use felt for the pages? When I first started thinking about making these books, I thought of using my zillions of cotton scraps, for the back grounds. Am I going down the wrong path? I have always used felt, but cotton scraps would work wonderful too. So no, you are not going down the wrong path.